Many of the editors I know are a somewhat shy bunch — more at home in margins than on title pages. It’s our nature to stay a bit more in the background. If a reader can make it cover to cover through a book I’ve worked on without giving any thought to my work, I figure I’ve done my job right. So unburying myself from my cozy stacks of proofs and submissions and stepping into the blogosphere spotlight? That doesn’t come particularly naturally to me. But I’ll tell you what can lure me out anyway. I know, I know — it’s a couple weeks early to be hitting that kind of theme too hard. Bear with me. Because actually what I find myself swooning over most often are stories. I fall in love with stories quite a lot. It’s an occupational hazard, I suppose. (And probably also a requirement for a children’s book editor, come to think of it.) Give me a startlingly honest character, an utterly perfect plot twist, or an achingly beautiful ending . . . and I’ll fall for those stories with the reckless abandon of a hormonal teenager. What’s more, just like that lovesick teenager, I’ll be only too happy to tell you all about them. A couple months ago, I was reminded all over again why I had fallen in love with one particular story. At some point I had described to my grandparents a few of the projects I had on my desk, and for whatever reason, one particular book caught my grandpa’s attention: Mikis and the Donkey. Set on the Greek island of Corfu, Mikis is the story of a boy whose grandfather buys a donkey — strictly as a pack animal, mind you. But Mikis is smitten with the patient, long-eared creature. He names her Tsaki, and the two quickly become inseparable. They have a year filled with adventures, and along the way Mikis and his grandfather both learn a little bit more about what it means to care for another being. From the very start of working on this book, I was delighted by its gentle, wry humor, and the way that the characters each feel realistic in their own way — imperfect but well-intentioned, quirky and limited and amusing and so very, very human. 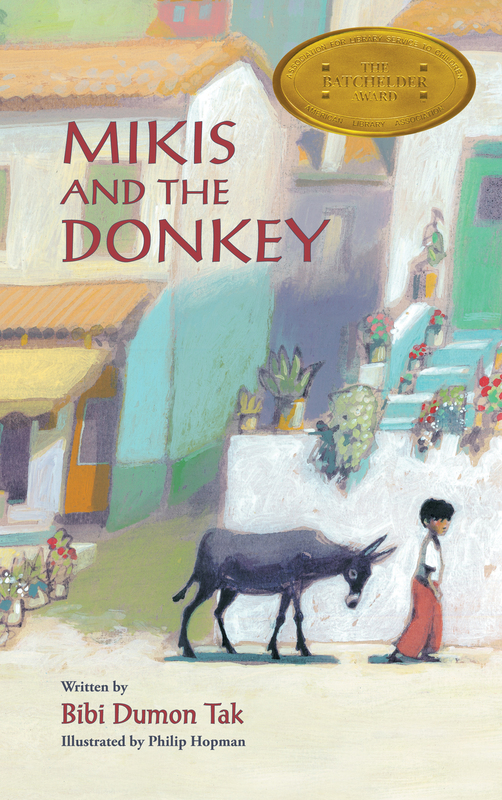 Though it’s set on a tiny, far-off Greek island, Mikis and the Donkey is a story that feels as familiar as they come. And with its four-legged central character, it’s exactly the sort of book I would have fallen in love with as a kid, too. Now, my grandpa is outside the book’s official suggested age range by a decade or seven — and he and I usually have rather different opinions about books. But I bought him Mikis for Christmas anyway, and he told me a few short days later that he thought it was really neat. (For him, believe me, this is the highest of praises.) He laughed out loud retelling the scene where Mikis discovers that Tsaki is bleeding and frantically takes her to the town doctor. It never ceases to delight me how stories can connect us to each other in unexpected ways. What I’m hoping to do in the posts that are coming is connect you, dear reader, with a few more stories. I want to share my love stories — the ways that I’ve fallen for some of the projects that I’m working on. I also want to give you a window into what it’s like to be an editor and work with these stories, a window into the conversations and issues that shape them into labors of love that will (hopefully) find their way into the hands of young readers (of all ages) who are eager to fall head over heels for the next good story. Kathleen Merz is managing editor for Eerdmans Books for Young Readers. Watch for her monthly From the Editor’s Desk column every fourth Thursday here on Eerdlings. Click to learn more about Mikis and the Donkey (written by Bibi Dumon Tak, illustrated by Philip Hopman, and translated by Laura Watkinson) on our website.